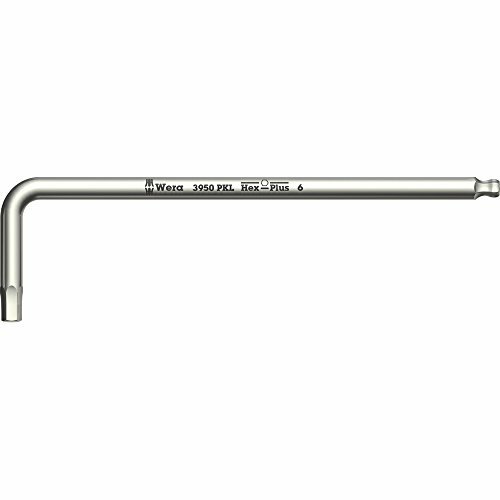 Wera 3950 PKL Long Arm Ballpoint Metric Hex Key is designed to keep rust at bay. Wera’s Stainless tool line is manufactured from 100% Stainless steel, preventing extraneous rust caused by use of conventional tools contaminating stainless fasteners. The unique vacuum ice-hardened process gives the necessary hardness for industrial applications. Wera’s Hex-Plus technology provides a greater contact surface that prevents rounded screws and fits every standard hexagon socket screw. Hex-Plus tools can transfer up to 20% more torque. Ballpoint on the long arm makes it possible to insert the tool into the screw more quickly and work at an angle even under difficult installation conditions. German Engineered. L-Key dimensions: 2.0mm hex; 4” long-arm length, 5/8” short-arm length. Wera – The Best Tools For The Job! If you have any questions about this product by Wera, contact us by completing and submitting the form below. If you are looking for a specif part number, please include it with your message.